Many patients dream of straightening their errant teeth and achieving the movie star smile they’ve always wanted – only to hit a roadblock when they realize they’re not willing to wear metal braces for years in order to achieve it. This hesitation is completely understandable to Dr. Maali, which is why he offers ClearCorrect as an appearance-friendly and wonderfully effective alternative for older patients. If you’re ready to schedule a ClearCorrect consultation here in Orlando, FL, don’t hesitate – contact Sand Lake Dental today! 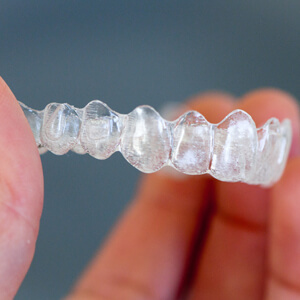 ClearCorrect is very similar to the Invisalign system in that, instead of the traditional brackets and wires, it features a series of clear, customized aligners. Patients will undergo 12 distinct phases of aligner therapy, with each phase featuring a set that will be worn for around three weeks. After completing each of these sets, patients should see noticeable improvements as their teeth are gradually adjusted and aligned. They will also undergo brief, routine checkups with Dr. Maali and our team so that we can determine their progress and provide the next set of aligners. Overall treatment time is likely to take one to two years. When wearing the ClearCorrect aligners, patients can expect them to blend in well with their natural smile, resulting in a beautifully subtle appearance. This means that those around you will be able to stay focused on YOU and not your orthodontic treatment. The ClearCorrect aligners are also conveniently removable, allowing patients to keep enjoying all their favorite foods and brush and floss like they normally would. The lack of irritating wires and brackets is much more comfortable for the patient’s mouth – the only sensation they’ll experience is smooth plastic that’s been custom-made for their unique smile.